Steve has a wealth of experience within the professional and financial sector having had an illustrious career at KPMG spanning 30 years. Serving on KPMG’s Boards for the UK, Europe and EMA, as well as Chairman of KPMG’s Midlands practice, Steve was one of the firm’s senior partners, working with local and global companies. 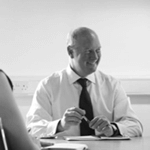 Steve advises and serves on the Boards of a number of private companies in the UK and USA and has extensive experience in cross border transactions. Following retirement from KPMG, Steve currently holds the deputy Chairmanship of the Greater Birmingham and Solihull Local Enterprise Partnership, The Chairmanship of Birmingham Metropolitan College, Chairman of the Board of Scottish American Capital LLP and PFHD Limited, Chairman to the Advisory Board of SORBUS and has recently relinquished his role as Chairman of Aston Villa Football Club. He regularly appears on lists of the most influential businessmen in the Midlands.